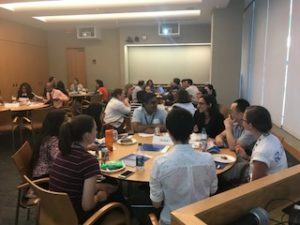 The Mentoring Sub-Committee of the Brigham and Women’s Hospital Postdoc Association (BWH-PDA) is launching a Mentoring Circle Program aimed at junior postdoctoral fellows. Mentoring Circles are groups of people who meet on a regular basis for an agreed upon length of time. Mentors are volunteer senior postdoctoral fellows at BWH, who have been trained to mentor junior colleagues towards their career growth. Mentoring Circles consist of 2 peer-mentors and 4-6 mentees, who meet monthly over the course of the academic year (September-May). Mentors and mentees are matched based on the information provided in Mentor and Mentee applications (focus of interest, career trajectory, etc.). Mentors and Mentees are recruited from May through August. The number of slots available for mentees depends upon the number of mentors that we were available to recruit. The circle provides an open and supportive environment for postdoctoral fellows to accelerate their professional development. The group shares career experiences, challenges, or opportunities with the aim of developing mentees’ self-confidence, leadership, communication skills, and professionalism. Mentors: are either (i) senior postdoctoral fellows with at least 3 years of experience post-PhD, or (ii) previous MCP mentee participants, who volunteer to mentor junior colleagues towards their career growth (mentoring training is provided by the program). Mentors are committed to dedicate a minimum of 2-3 hour-session per month over the academic year (September-May) and to attend to 4 Mentoring events during the year. Mentees: are junior postdoctoral fellows within the first 2 years of their fellowship at BWH. Mentees are committed to dedicate a minimum of 2-3 hour-session per month over the academic year (September-May) and to attend to 3 Mentoring events during the year. What is the program time frame? The Program will start with a kick-off event in August/September, where mentors and mentees will meet for the first time. Then, circles will meet monthly over the academic year (September-May). The official program will end with the Mentoring Celebration in May/June, but these mentor-mentee relationships can last a lifetime. Mentees and Mentors must attend the August/September orientation event to participate in the program. Acceptances to the program will be sent via email in August, at which time information on registration for the orientation event will be sent. Circles commit to meeting 2-3 hours at least once per month, and to attend the kick-off event in August/September. Mentors additionally commit to a Mentor-only training event in August/September. Mentors and mentees must make a strong commitment to attend each session and ensure continuity of the circle. A person’s ability to attend a meeting affects everyone in the circle. What is said in a circle meeting must stay within the circle. Everyone in the circle must enter with a willingness to share honestly and openly. Everyone must be able to trust everyone in the circle. The success of the circle is highly dependent on the openness, honesty and sharing of all members. Appreciate the mix of personalities and talents in the group. Individuals may not necessarily like one another, but should understand that there is something to be gained from everyone. Have more questions about the BWH-PDA Mentoring Circles Program? Email us at BWHPDA@partners.org.